In the tragic event that you're involved in a plane crash, following the instructions about bracing for impact really could help minimise your injuries. The main advantage is in keeping your head close to the seat in front of you, preventing your head and torso from swinging forward in a whiplash like effect. Despite myths that brace positions increase your chance of death — Mythbusters, appropriately, busted that one — studies of actual crashes and of test dummies confirm that brace positions really work. The exact best position depends on the particulars of your body, the direction of the crash and how much space is available in your seat. 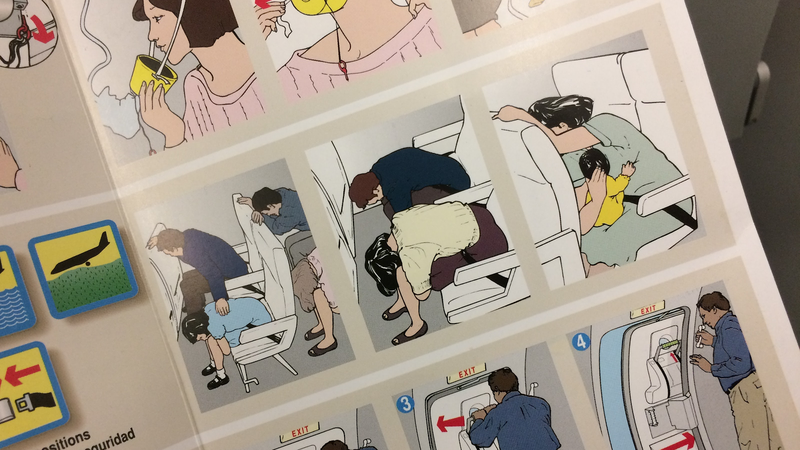 The positions recommended by your aeroplane's safety card are pretty good as a rule of thumb. Stewardess: Heads between the knees! Between your own knees, Father!